Fort Reno BBQ opened in Park Slope months ago, and my visiting ended up being side-tracked by the book, school, repeat visits to Talde, you know, life. But the other day I made of point of going. I wanted to find out what this Hot Mess was all about. The Hot Mess is their entree item that comes as a meal in a jar. 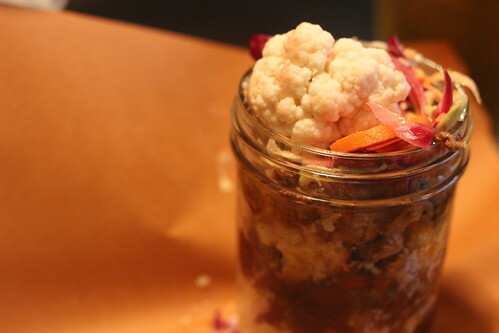 Literally a mason jar full of layers of their sides and meat. The top layer being cauliflower and pickled vegetables, then coleslaw, pork, corn bread, and finally mac and cheese. Bonus: reading the first few pages of Wetlands after eating these cauliflowers. Is the dish novel? Yes. Is it so awesome I'd get it again instead of a sandwich and a side? No. With so many things crammed into a jar, I found myself wanting more since each was simply a sample taste. On the other hand, my pulled pork sandwich allowed me to have my fill of tender porcine goodness on buttered Texas toast. What I did walk away knowing is that their mac and cheese is creamy and delicious, like white cheddar Velvetta and shells. Don't hate! Totally getting that as a side next time.